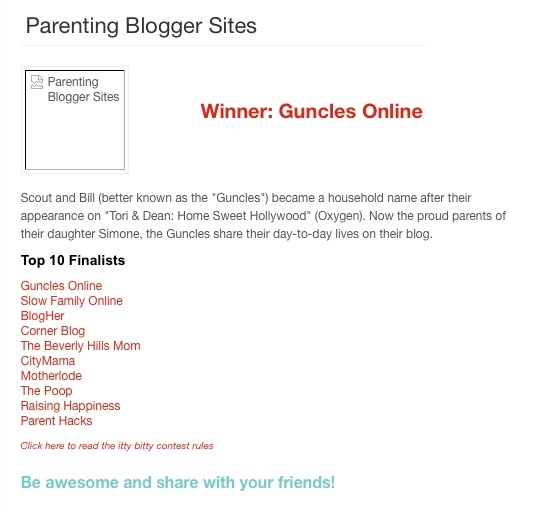 Last updated by suzlipman at April 30, 2016 . Early famous senders of valentines include Charles, Duke of Orleans (like St. Valentine, also in prison) and King Henry V. Geoffrey Chaucer and the poets of the Medieval era linked valentine symbolism to birds, and specifically lovebirds, whom they observed beginning their mating rituals in early spring. Today, 25% of all cards sent in the U.S. per year are valentines. I love this holiday of love and offer a collection of the Slow Family Valentines posts over the last few years. There’s something here for every celebrant, from parents and teachers seeking easy Valentine crafts to historians and collectors of vintage and rare valentines, to those interested in nature and animals and the ways in which they mate, feed and otherwise display their wonders during mid-winter and throughout the year. Enjoy this annual celebration of love! 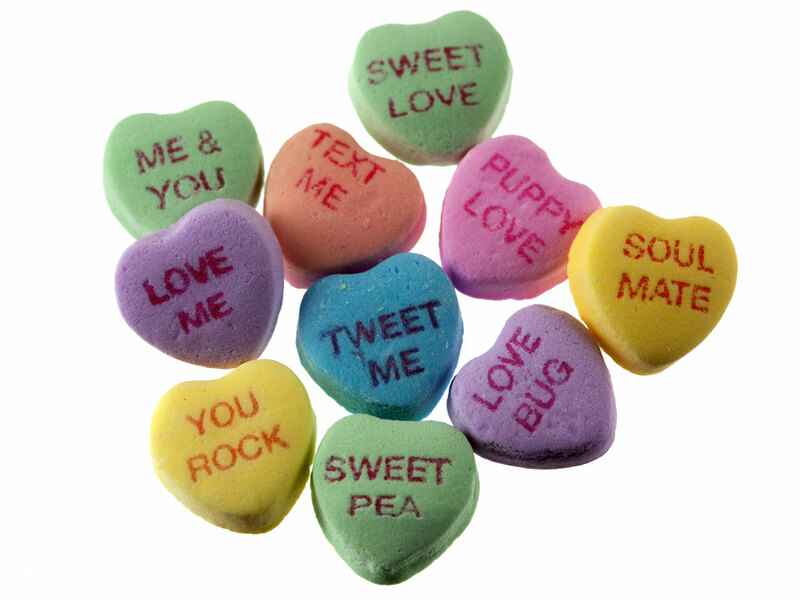 Iconic, goofy and sometimes romantic candy hearts from Necco are the second best selling Valentine’s Day candy, right behind chocolate. 8 billion little Sweethearts are produced each year. 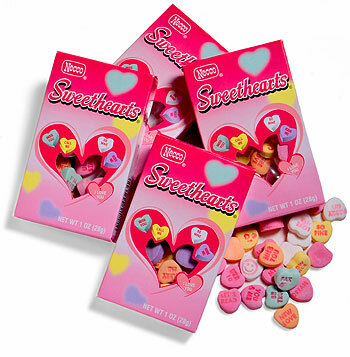 Their bright, chalky colors and pithy and sometimes irreverent candy heart sayings have been entertaining people and helping them declare love for 147 years, ever since the brother of the original Necco creator designed a machine that stamped words directly onto the candies with red vegetable dye. The original candies were large and had various shapes. When the company arrived at the small heart shape in 1902, the sayings got smaller to accommodate it. 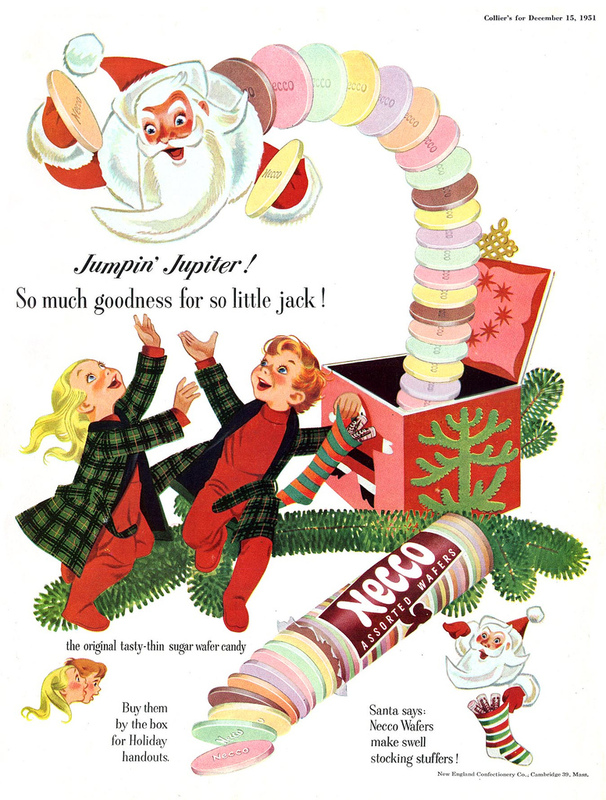 Necco wafers themselves have been around 166 years and even accompanied two explorers on their expeditions (Admiral Byrd’s to the South Pole and Donald MacMillan’s to the Arctic) in addition to feeding the WWII troops. Necco’s wafers and sweethearts even survived a move to “healthier” flavors three years ago, which was thankfully scrapped. I’ve watched the sayings get updated over the years, as new ones like FAX ME and E MAIL ME came and went. New sayings in recent years include TEXT ME and TWEET ME (how long will these last?) as well as MY PET and U R HOT, as an addition to classics like SOUL MATE, SWEET PEA, SAY YES, TRUE LOVE and ALL MINE. Perennial favorites from the early years include BE MINE, BE TRUE, MARRY ME and KISS ME. The company adds about 20 sayings, out of 80, each year, so naturally some older ones are not going to make the new group. New sayings are often themed, like these pet-themed ones from 2007. Some of my favorite new sayings over the past decade include HEART OF GOLD, MELT MY HEART, CLOUD NINE and HONEY BUN. A few that have bitten the dust, mostly because their lingo became dated, include DIG ME, HEP CAT, HOTCHA, SAUCY BOY and OH YOU KID. However you express it, Happy Valentine’s Day! Bonus Trivia Question: What does Necco stand for? Here’s how to make your own fun and easy homemade valentines. Early famous senders of valentines include Charles, Duke of Orleans (like St. Valentine, also in prison) and King Henry V. In the early 1700s, valentine “writers”, or booklets of decorative verse, were all the rage. In the 1800s, people favored “Daguerreotype” valentines, based on the new tintype photos. The Victorian era ushered in valentines that were more similar to the ones we know today, helped along by new methods of printing and mass production and inexpensive “penny post” mailing. This is a wonderful history of valentines and Valentine’s Day. This is Charles, Duke of Orleans’ valentine, now in the British Museum. Colorful, often mass-produced valentines really took off in the 1920s. Their popularity soared as children became increasingly involved in giving and receiving them. Some early valentines depicted household items, animals, professions and new modes of transportation and many employed fun puns and wordplay. Their heyday occurred during a wide swath of mid-20th century, before valentines largely became the province of licensed characters from TV and movies. I’ve rounded up some of my favorite valentines by theme. My love for painted advertising signs on the sides of brick buildings is well documented here. It’s not unusual for me to yell “Stop the car!” or slow my family on a walk to capture one with a camera. More commonplace in earlier decades, they used blank brick canvasses to sell everything from mining equipment to toothpaste. I love coming upon them on country roadsides and in city alleyways. This bright one near St. Johnsbury, Vermont, was no doubt repainted and lovingly refurbished to its old-timey feel. I don’t think the site is a general store any longer. I’ve since learned that Occident Flour was produced by the Russell-Miller Milling Company in the midwest from 1894-the early 1950s. It was sold to the Peavey Company in 1962 and acquired by ConAgra in 1982. That trajectory, along with newer advertising methods, partially explains the loss of painted signs for individual concerns. This past weekend, I had the pleasure of participating in an old-fashioned party to celebrate my wonderful town’s library, which turned 100 years old. Originally built as a Carnegie Library, in what is now a stately brick house, the Mill Valley Public Library has grown from an institution with 750 donated books to one with 132,000 books, a digital collection, a team of librarians, and live offerings almost every day it’s open, from noted local authors to pre-school story times, to performances outdoors and in. No wonder our library thrives while others around the country are forced to close. 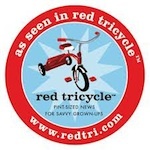 Hundreds of visitors per day find it relevant and exciting, a true community hub. It was terrific then, and very fitting, to honor the library’s Centennial with a gathering in the grove of redwoods that adjoins it. There was a free and continual program of old-time music, a birthday cake, announcements and proclamations, sodas and hot dogs, crafts, library trivia contests, and games, which I led with Research Librarian Cara Brancoli and which, in keeping with the historical spirit, included Tug-of-War, Three-Legged Races, Sack Races, and Egg-and-Spoon Races. We also had jacks and hula hoops out for free play. Wonderfully, many children, especially the smaller ones, rolled the hoops, just as children may have done 100 years ago. It was truly lovely and warm (in spirit, if not temperature.) Liz Greer of Mill Valley Life took some wonderful photos that really captured the event, as did Hans Roenau in the Mill Valley Patch. Hold on to your ribbons and keys: The world’s last typewriter factory, located in Mumbai, India, is closing its doors. As late as 2009, the factory, Godrej and Boyce, was still rolling out 10-12, 000 machines a year (down from 50,000 a year in the 90s). But the ubiquitous computer just proved too much for it. The concept of impressing ink-coated letters onto paper may date to a 1714 English patent held by Henry Mill. 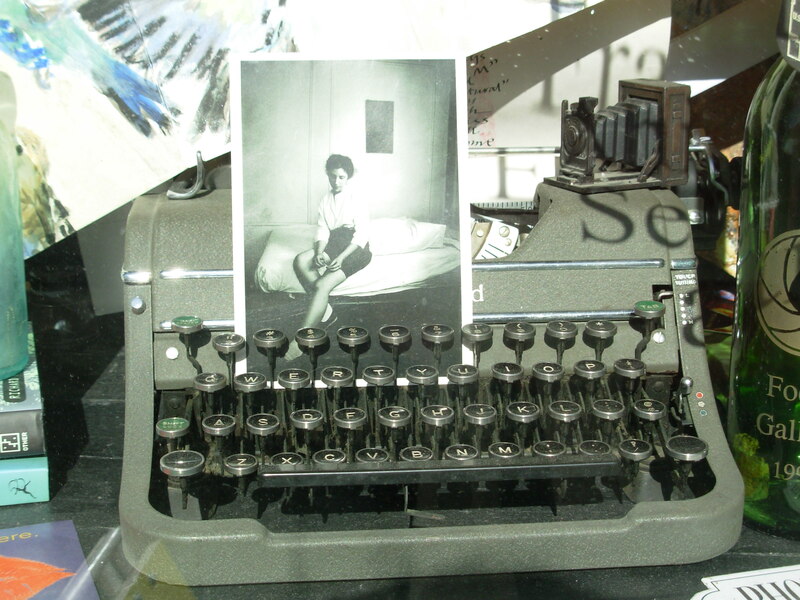 The first working typewriter was said to have been built in 1808 by Italian Pellegrino Turri. 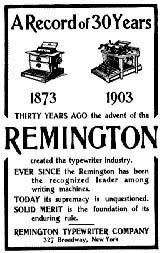 Our current typewriters (and computer keyboards) owe the most debt to the Sholes & Glidden Type Writer, produced in New York, beginning in 1873, from gunmakers E. Remington & Sons. Some of you may still have Remington manual typewriters. Sholes, a newspaperman from Wisconsin, created the QWERTY keyboard that we still use today. The first one made only capital letters. There is more early typewriter history on this excellent site. This is another great site featuring lots of pictures and information about different models of early typewriters, from American Visible to World. 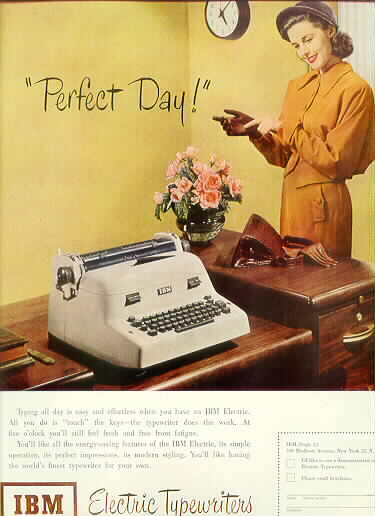 U.S. typewriter production was dominated by just four brands — Underwood, Royal, Remington and Smith-Corona — from the 1920s until they stopped production. Remington, then Remington-Rand, moved production to Europe in 1961. 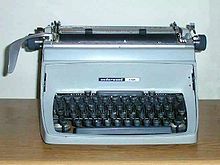 The last Smith-Corona and Royal typewriters came out in the 1970s. 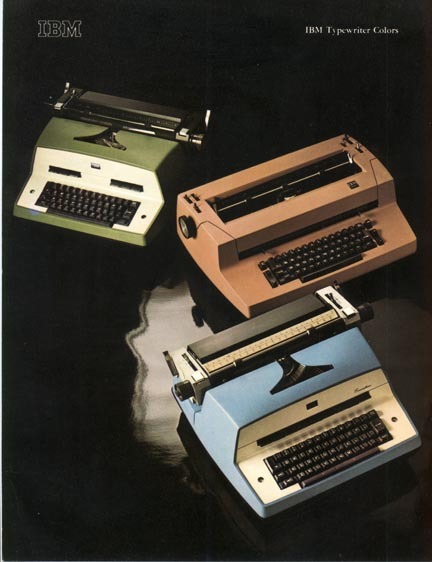 Underwood merged with Olivetti in 1963 and began diversifying. The last Olivetti portable typewriter was produced in Spain in the 1980s. 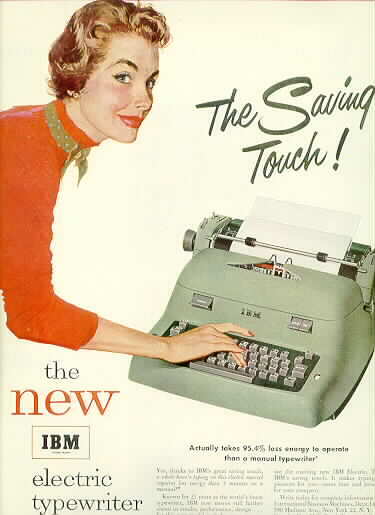 Though I typed a “novel” on a manual typewriter in 6th grade ( a tome in which terrible fates befell the fictional denizens of an elementary school, truth be told), and learned manual typing from typing teacher Stella Staley to prepare for high school, for most of high school I typed papers on a series of lovely IBM Selectrics. 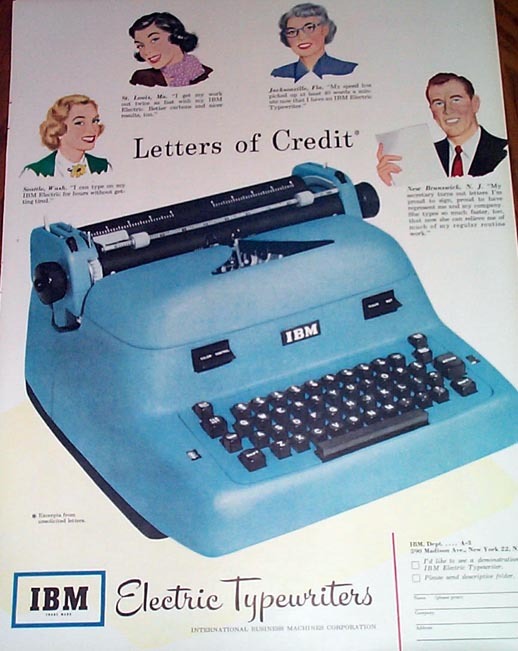 These were probably the slightly outdated castoffs from my parents’ ad agency office, but still — they were quite sleek, in lovely colors (robins egg blue or gunmetal gray), and they had fascinating metal balls that spun around to find the designated letter. Best? You could change the font by changing out the ball. (I also remember the change-over from white-out to type-out correction paper.) It turns out IBMs had been somewhat stylish (and electric) since the 1930s. Now, of course, there is a collectors’ market for typewriter ribbons and other accessories, not to mention the typewriters themselves. And while news of this last typewriter rolling off the factory belt may hit some of us with an odd sense of surprise and nostalgia, I note that the same keyboard from almost 150 years ago is still with us, and that some people (even in high schools today) continue to say “typing” rather than the duller-sounding “keyboarding” or, God forbid, “word processing”. This wistful change brings both and “end of an era” feeling and the notion that I personally can’t imagine how long-form writers ever typed complete novels without the luxury of inserting, deleting, copying and pasting at will — even if I once tried it myself. Be sure to see: The typewriter dance number. This just in: Some typewriters are apparently still being made, in the U.S., for the prison market. So, perhaps more accurately, the world’s second to last typewriter factory closed its doors. 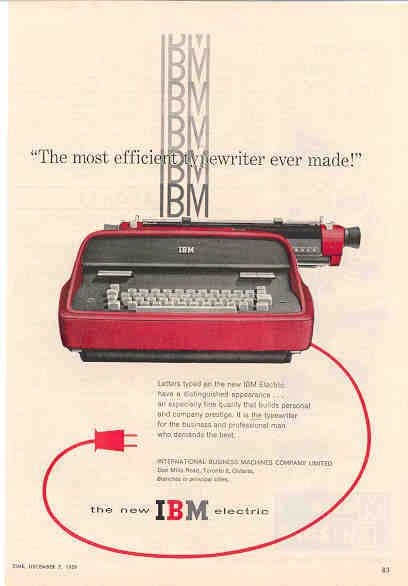 Photos: IBM typewriter ads, top to bottom, Model Year 1954, 1930, 1948, 1948, 1959, 1967. These and many more on etypewriters.com. Early writing ball typewriter, 1903 Remington ad and popular 1920s Underwood 5 manual typewriter on this typewriter history site. 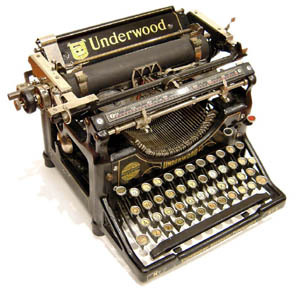 Later Underwood 5 typewriter on Wikimedia Commons. Though we all love a good laugh year-round, April Fools Day offers some great opportunities to crank up the pranks. Here are a few simple pranks that are great for all ages and use simple kitchen ingredients. Why do we even celebrate April Fools Day? Even though the Julian calendar, which we use, was adopted in 46 B.C., many Europeans were resistant to the change — really resistant, as it turns out. For centuries, their New Year coincided with Easter and other Spring celebrations. In the 1560s, France’s King Charles IX finally decreed that the New Year should officially begin on January 1, and Pope Gregory in Rome followed a full 18 years later. It is said that the Europeans who hadn’t gotten the memo on the date change continued to celebrate New Year’s in April, thus they were considered fools, and the source of our modern day pranks. 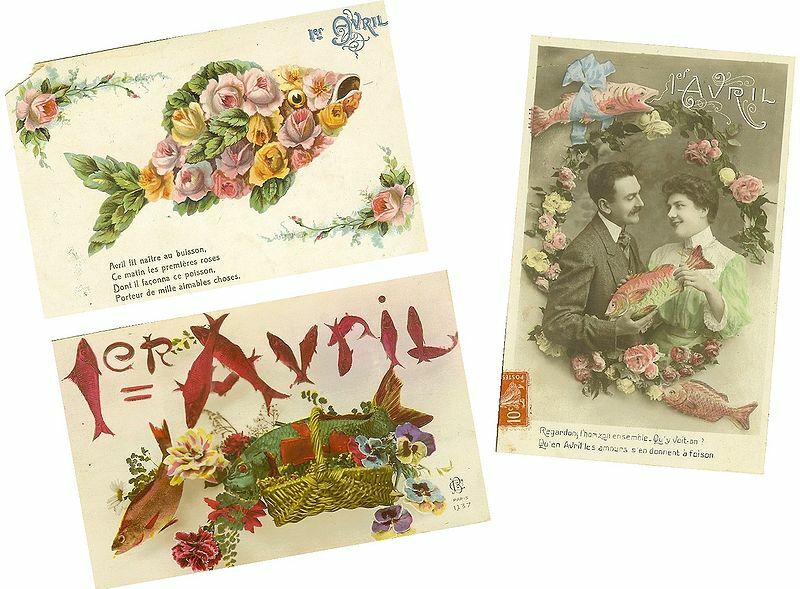 Other theories hold that April Fools Day arose from the Spring renewal festivals that have long been held throughout the world. These have wonderful names and customs – Hilaria in Rome; Holi, the festival of color in India; Hock-Tyed, a randy event in Great Britain. The Museum of Hoaxes site has more information about April Fools Day in history and literature. The infoplease site casts some doubt on the calendar theory and posits another, from Boston University History Professor Joseph Boskin, who explained that a group of court jesters told the Roman emperor Constantine that they could do a better job of running the empire, so he let a jester named Kugel be king for one day. “It was a very serious day,” Boskin said, and his story was run by the news media in 1983. There was one glitch: Boskin himself had made the story up — in great April Fools Day tradition. So, what are some fun and easy April Fools Day pranks that you can pull on your family? I’ve often used mealtimes to turn the tables and have some fun with food pranks, many of which will be a treat to eat even after the joke’s over. All of these are quick and easy to pull off, with ingredients available at most grocery stores. Cut the pound cake into slices to resemble bread. 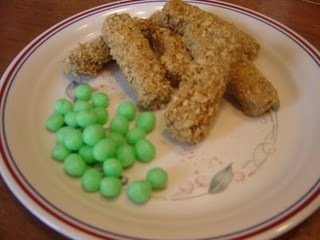 Toast them in an oven (on a cookie sheet) or in a toaster oven just until they turn golden brown. Once they’ve cooled a little, stack two slices for each sandwich and cut each stack in half diagonally. Mix drops of the red and yellow food coloring into the frosting, stopping when the frosting appears like American cheese. Carefully spread a generous amount of frosting onto the bottom slice, then gently press the top slice over it. This will make the frosting ooze a bit over the sides of the “bread”, so that the whole resembles a melted cheese sandwich. Place a scoop of ice cream or frozen yogurt on a plate. Top with butterscotch or caramel sauce. Let the sauce drip down to resemble gravy. Place the banana into the hot dog bun. Mix drops of red food coloring into a couple of spoonfuls of peanut butter until the color of the peanut butter resembles ketchup. Mix drops of yellow food coloring into a couple of spoonfuls of yogurt until the color of the yogurt resembles mustard. Generously spread the “condiments” over the banana to make the hot dog. Spoon a generous amount of marshmallow sauce on a plate or a piece of toast. It will spread. Finesse it with a spoon into an egg-white shape. 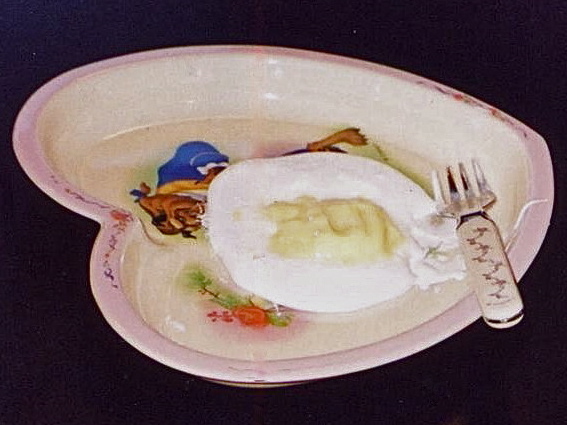 Place a small, neat spoonful of pudding or yogurt, or the canned peach half on top of it so that the whole resembles a fried egg. A package of flavored gelatin. Dissolve the gelatin according to box directions. Pour the gelatin into drinking glasses and place a plastic straw in each. Refrigerate the gelatin until firm, then watch when someone tries to drink their “drink”. Combine the ingredients for the meatloaf recipe. Before baking, divide the mixture into the two round cake pans and pat it flat. Bake as usual, shortening the cooking time to adjust for the thinness of the meat loaves. Prepare the mashed potatoes, adding a little extra milk to them and whipping them until they are fluffy. Once the loaves have cooled a little, place one of them onto a plate and cover it with a thin layer of mashed potatoes. Place the other meatloaf on top of the potato layer, and finish frosting the “cake” with the remaining potatoes, swirling them with a knife to imitate cake frosting. Decorate the top with a fun April Fools’ message. Even if you don’t have time to make or buy special food, you can serve a meal backward, starting with dessert. Or you can have a whole backwards day where meals are concerned. Even a few drops of food coloring can instantly change a bowl or oatmeal or a scoop of mashed potatoes. Have fun and get silly! Happy April Fools Day. These and other fun pranks and seasonal activities appear in Fed Up with Frenzy: Slow Parenting in a Fast-Moving World. San Francisco’s North Beach neighborhood is perfect for strolling and for conjuring just a bit of San Francisco’s Beat era history. Our family ends up there a lot. We peruse the small shops with their arcane displays. We get fresh-baked biscotti in Italian North Beach, or dim sum in neighboring Chinatown. We buy beads and postcards, leaf through records in low-ceilinged store basements, where milk crates are stacked floor to ceiling and a person can barely squeeze between the stacks. Among the old, there’s always something new. A fresh look down a street that winds all the way to the Pacific Ocean, or up at a line of laundry blowing in the breeze between buildings. I hope the arcane and the lovely find you, wherever your travels take you. Michele at Fun Orange County Parks has gotten the ball rolling by submitting a wonderful, magical picture. Thanks for playing, Michele!